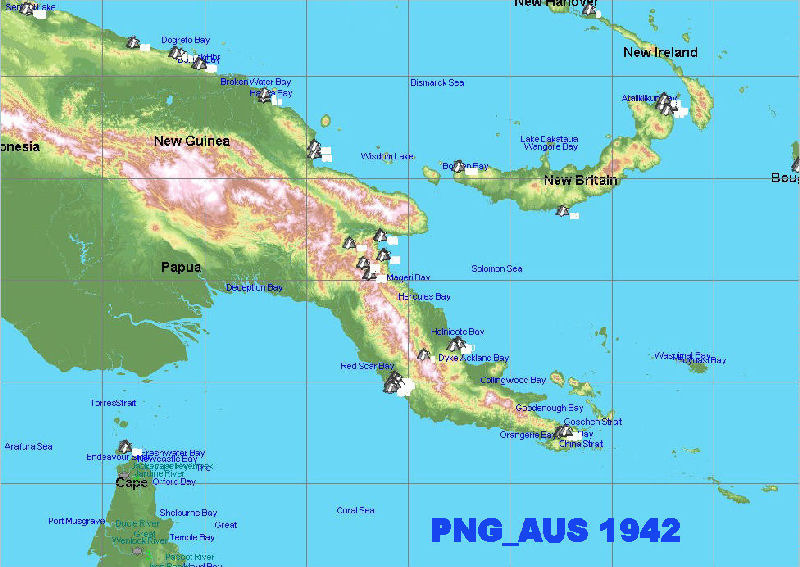 As promised, here is the 1942 version of the PNG_AUS map! In this initial listing, I have changed/deleted/added airfields and re-textured numerous areas on the map to represent what this area of the world looked like during the summer of 1942. If I have left anyone out, I am sorry, please let me know and I will be sure to add you to the list! I have researched this time period and received additional recommendations from other users but if anyone has additional information to make this map more correct, please let me know! I want this map to be as accurate as possible. 1) Decompress the download and copy the "AUS_PNG Full Update 15_08_2015" folder to your jsgmemods folder. 2) Create a new folder depending on your version of IL-2 (i.e. #UP#, #DBW, etc.) inside the "AUS_PNG Full Update 15_08_2015" folder and then move the "MAPMODS" folder and it's contents inside that new folder. 3) Then add the line contained in the file, "Add this to your all.ini file" (located inside "MAPS" folder) to the top of a copy of your current "all.ini" file and save it to the "MAPS" folder. If you have previously installed maps to your IL2 version, your current "all.ini" file is located in the "#UP#\Mods/MapMods/Maps folder. If you have not previously installed new maps, your current "all.ini" file is located in the "#UP#\STD\com\Maddox\il2\objects" folder. Replace "#UP#" with "#DBW", etc. depending on the mods folder of your IL2 version. 4) Activate the map in JSGME. 1) Decompress the download and copy the "MAPMODS" folder and it's contents directly to your #UP# (or #DBW, etc.) folder. If it already exists, merge the two folders. 2) Then add the line contained in the file, "Add this to your all.ini file" (inside "MAPS" folder) to the top of a copy of your current "all.ini" file and save it to the "MAPS" folder. If you have previously installed maps to your IL2 version, your current "all.ini" file is located in the "#UP#\Mods/MapMods/Maps folder. If you have not previously installed new maps, your current "all.ini" file is located in the "#UP#\STD\com\Maddox\il2\objects" folder. Replace "#UP#" with "#DBW", etc. depending on the mods folder of your IL2 version. A really loving map mates! A milestone for every pacific scenario! All we are amazed and grateful to you! this was long(waiting )...but this is one of the better pacific maps(now I can make Lae raids or Bismarck's see battle). I also am working on missions that cover the career of George Welsh. Besides being one of very few pilots that got off the ground at Pearl Harbor, he also went on to be an ace in the PNG theatre. I will be able to use both the 42 and 43 versions of this map! Fantastic - great job! This will complement the Solomons map for the crucial south pacific air war campaigns. There is some great info in Eric Bergerud's book "Fire in the Sky", excellent reading for this theatre. This game just gets better and better due to the efforts of all the fabulous modders out there - a great big thank you to you all!. Congrats Dennis, Kirby et al! This map was truly Dennis' effort Thorst. THX for your work this map is a long waiting one !!! I just want to know if it's possible to do a trail net with briges in the sector between Buna and kokoda and around Lae, Wewak or Rabaul areas?...This for a potential 49th FG campaign..
And a question, don't you think that the Dobodura base and the one next to it, with there "concrete style" look more 44 than 42...? thx again for this big job !!! Jim, well, if you are willing to work with me I will sure try to accommodate you. The trails and bridges are something else. If you are talking about the "Kokoda Track", I am aware of that and can find maps showing the route. So, with some work, that can be added. But as far as trails around Lae, Wewak and Rabaul, I'm not as familiar with those and do not have maps showing them. If you have maps or can provide links so I can see where they should be located, I will give it a go!